Hey guys! This week’s post was written by personal development expert Maveen Kaura of Discover Your Life Today. Maveen is in my mastermind group, and has contributed a lot of great ideas to the site. He also adds a lot of value to my life in general. An announcement is made over the speakers. “Five minutes before John Legend is on stage”. The atmosphere is very exciting. People are enjoying a few cocktails and wine before the concert starts. My wife and I make our way to our seats. We can really feel the energy of the auditorium as the crowd waits for the lights to dim. A few seconds later the lights go down and the crowd starts cheering. Three violinist, one cello and guitar player come out on stage. The lights dim some more and now the spotlight is on the musicians. They concert starts with them playing very soft mood-setting music. Wow! What a powerful voice and lyrics to start the concert off with! John Legend continues singing and playing piano for two hours. He goes through his discography one song at a time performing songs like, ‘Who Do We Think We Are’, ‘Used To Love U’, ‘Ordinary People’, ‘Let’s Get Lifted’, ‘Save Room’, ‘You & I’ and ‘All Of Me’ to name a few. He tells his story about being at a job doing desk work. How he starting off playing the 5:30pm show at the Living Room in New York. He was excited when only a handful of people would show up. He talks about touring with Usher and Kanye West. John would play piano for Kanye and have the chance to sing one song at every performance. He talked about his grandmother and her influence on him and his music. He talked about being on Jimmy Fallon and performing his version of a Bruce Springsteen song. A year later, Bruce asked John if he would perform as he was being honoured at an event. When the Boss asks you, how can you say NO? The All of Me Tour was amazing for all the people who attended. For those who decided to stay home all I can say is get tickets next time. This was the first time John Legend had come to Calgary, Alberta and sold out. The night was intimate and interactive just as you would expect from the artist and the venue. The emotion of his music is love, hurt and relationships. Everyone can relate to his music. It was amazing to see and hear the crowd singing along, cheering, and holding hands with each other. If you do not listen to John Legend because you are not a fan of his music or if you do listen to him because you are a fan of his music, one thing is for sure; you should appreciate the art of performance and what he does on stage with a piano and his voice. 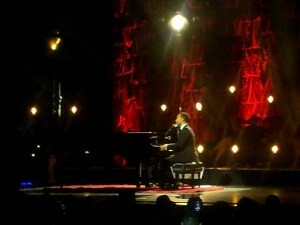 For this concert review this is Maveen Kaura signing off from my floor seat Row K seat 53 at the John Legend concert.